﻿ What Should I Do If My Car Breaks Down? Turn on your hazard lights to alert other drivers that you’re experiencing vehicle trouble. If possible, pull over to the right shoulder of the road at a place that’s away from curves. Once you are pulled over, activate your emergency brake to keep your car in place. If you’re safely on the side of the road, lift your hood to signal to others that you’re having car trouble. Call for help. 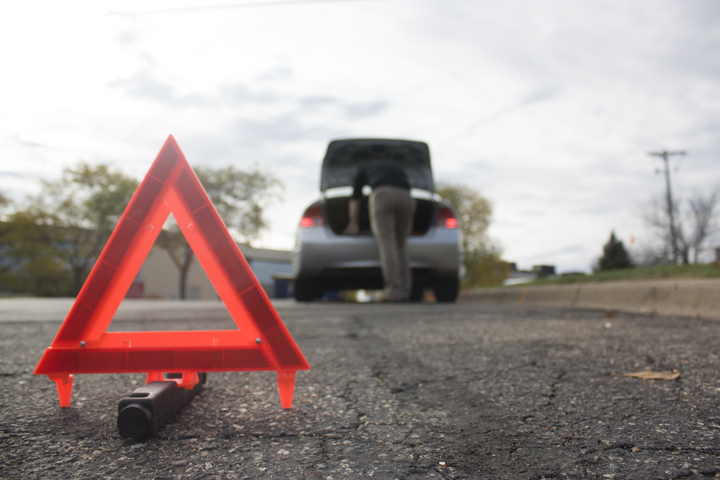 If you have a roadside assistance service, contact your provider. If you do not have roadside assistance, call a local towing company or 911. Do not get out and work on your car if it requires being on the side of the car that’s closest to traffic. If you’re pulled over in heavy traffic, it’s safest to exit your vehicle through the passenger-side door. If your car is smoking or you see flames, exit the vehicle as quickly as possible. If your vehicle breaks down in the evening hours, put reflective markers or warning lights behind your car so it’s easier for other drivers to see you. Turning on the interior light of your car can also help. Many insurance companies offer optional Roadside Assistance coverage on personal auto policies. Western National offers this coverage through its Highway Emergency Loss Protection (H.E.L.P.) program. The H.E.L.P. program is available 24 hours a day, 365 days a year and provides a group of coverages that are valuable in emergency situations. Coverages include towing, fuel and fluid delivery, flat tire service, battery jump start, and more. To learn more about roadside assistance options available to you, contact your Independent Insurance Agent.